General description : STRONG AMC 360 V8, 4SPD TRANS, PWR STEER, SOFT TOP, SOLID & CLEAN IN/OUT, NICE!! 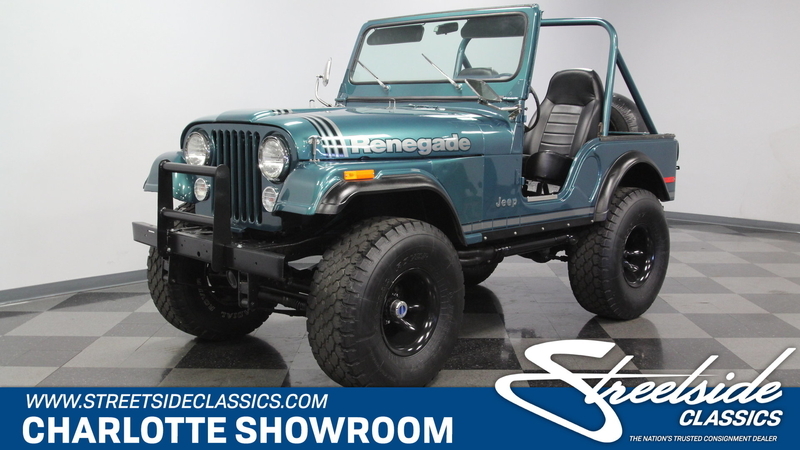 With its V8 power, lifted suspension, and true 4x4 prowess, this 1979 Jeep CJ5 Renegade shouts to you, "Let's go play in the dirt!" But with the glossy paint and stylish execution it's also quite an attention-grabber in-town, too. That's why you know it's one awesome total package. This Jeep is distinctive from the first moment you lay eyes on it. The green paint has a nice deep tone that could almost blend with the pine trees. But then the sunlight hits it, and the metallic elements radiate the kind of luster that only comes from investing in a professional modern application. It's also the perfect complementing color to the full Renegade graphics package on the hood, running down the sides, and wrapping around the rear. The black stripes in this also complement the fender flares, brush guard, full-size spare, and blacked-out 15-inch wheels. Plus, the crisp Bestop doors and roof also add to this presentation when they're in place. So while we love all Jeeps for their outdoor toughness, this nicely coordinated package is a reminder that we use these to look good on grocery runs, too. The full coordination continues inside with the dash and roll bar matching the exterior green and everything else finished in a deep black. This nicely finished package is a reminder that a good Jeep spend most of its time open to the world. In fact, with the comfortable bucket seats covered in a durable vinyl, and the whole floor covered in tough liner paint, a day playing in nature can be cleaned with something as simple as a garden hose – exactly what you want in a go-anywhere Jeep. The final piece to a great Jeep is proper power. AMC's 360 V8 has the right horsepower and torque to get you into and out of trouble. As you look at the bright block paint, shining valve covers, matching air topper, new belts, and the overall fresh presentation – well then, you know they invested far more in this one than just great colors. Not only do you have V8 power, but it also does a terrific job of announcing its prowess thanks to headers that feed the growling side pipes. But don't just listen to them; follow the path in the undercarriage photos. There you'll spot a fresh presentation everywhere, including on the 4x4 transfer case. Plus, there are also nice upgrades like the coilover shocks. No matter if you're on the street or trail, you'll enjoy the full control of the V8 powerhouse with the four-speed manual transmission. Plus, there's great anytime driving features like the power steering and front disc brakes. 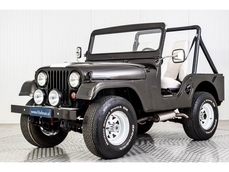 This restored Jeep was made to go farther and look better doing it, so it's exactly what you want in a classic for so and go. Don't miss out, call today! 1979 Jeep CJ5 360 V8 is listed for sale on ClassicDigest in Charlotte, North Carolina by Streetside Classics - Charlotte for $23995.